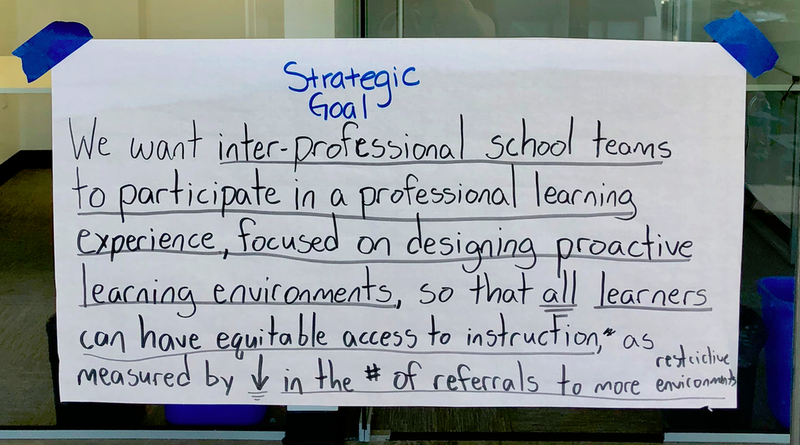 By leveraging the power of interdisciplinary collaboration between competent and confident educators, BCPS district leaders believe that they will be able to design and establish Tier I learning environments that are positive, proactive, and inclusive. Specifically, they will be able to create classroom communities that do not exclude students with certain behavioral, academic, and SEL challenges. At the heart of that statement, Maren was expressing that regardless of whether or not a student receives special education services, they are entitled to the least restrictive environment. Maren Townsend–Coordinator of Related Services, Connee Hart–K-12 Supervisor of Teaching and Learning, and Liz Berquist–Coordinator of Organizational Development engaging in learning at Goalbook’s 2018 Winter Leadership Design Institute. 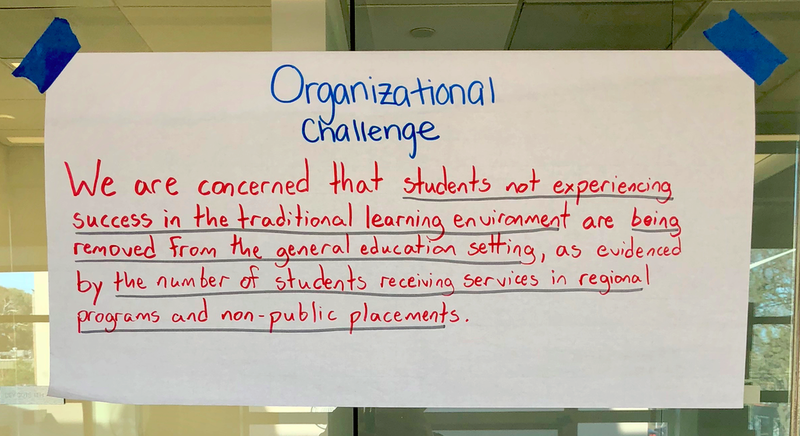 Prior to attending Goalbook’s Leadership Design Institute, BCPS leaders Maren Townsend, Liz Berquist, and Connee Hart observed an unusually high number of students who were being pushed out of gen ed classrooms into Tier III environments. They also noticed that the number of black and Latino male students being referred for special education services was considerably higher than their peers. Their observations revealed that the learning environments that these students were being pushed out of were not designed to optimally support them. They came to LDI to devise a strategic plan to create positive, proactive, and inclusive learning environments that accommodate a greater level of student variability. Particularly, they wanted to ensure that the groups being excluded from classrooms were getting what they needed. They define a positive, proactive, and inclusive learning environment as one that provides both teachers and students access to resources and strategies that allow them to persist through circumstances that result in the exclusion of students. Maren, Liz, and Connee went through all 5 steps of the design thinking process: empathize, define, ideate, prototype, and test in order to land on the solution that would have the greatest potential impact on their organizational challenge. When the leaders from BCPS began to design their solution, they recalled the reality of their previous experiences in the classroom. The feeling of isolation brought on by having a limited repertoire of usable strategies and the recollection of the power of collaboration to augment areas of growth immediately came to mind. Drawing upon the design principle of empathy revealed that no individual teacher has the expertise or patience to successfully confront and mitigate every academic, behavioral, or SEL challenge every time. And that is okay, provided that teachers have the support of a team of educators with different areas of expertise to help them solve problems and improve their learning environment. How might we provide our teachers with structures that encourage interprofessional, collaborative problem solving focused on designing proactive learning environments? Their solution: Interprofessional Collaborative Learning Communities (ICLCs). Educators would work together to design healthy learning environments. A healthy learning environment is far more than the physical space—it is about leveraging interdependence between all stakeholders in the spaces where students are learning. This interdependence manifests itself in collaboration between general educators, related service providers, and special educators. It also shows up in the development of relationships with students that allow teachers to identify the best ways to support them. Success for BCPS means leveraging the power of community and embracing interdependence. No teacher wants to feel like they can’t support one of their students or that they excluded a member of their classroom community. Leaning into interdependence helps them avoid that. Interdependence manifests itself in professional development opportunities that look like collaboration between teachers, specialists, and related service providers as well as developing strategic lines of communication that help educators sustain success. BCPS teachers working together to come up with lasting solutions to complex challenges. The prototype solution that they came up with was the first step in starting an ICLC: a recruitment letter meant to target competent and confident educators eager to design solutions to sub-optimal learning environments. By designing around the competency driver, as outlined by the Implementation Science framework, BCPS leaders are placing their trust in their most powerful resource—their teachers. Their hope is that this cadre of educators will help shape a culture and environment at BCPS that fosters sustained success behaviorally and academically in Tier I environments. Goalbook’s annual Leadership Design Institute (LDI) is a conference for district and state-level instructional leadership teams held each winter. Our upcoming conference is the Goalbook User Symposium (GUS) which will be held in New York City in July. Registration information can be found on this page.